Thus, Rodney has paved the way for his latest collection of gems. These are songs that demonstrate his talent for words and storytelling wrapped around a loose concept album reflecting key periods through his life. So, the album opener East Houston Blues is about a tough childhood in Texas, ‘I don’t believe in love and this I guarantee, if there’s a God above, he’s got it in for me.’ Nashville 1972 moves us on to his arrival as a young songwriter in Nashville with memories of meeting the likes of Willie Nelson for the first time. Crowell uses his memories as the raw material for his songs and there is an overriding feeling here of honesty and reflection. Forty Miles From Nowhere is one of the most achingly sad and haunting songs of loss that you will hear this year. You may never find another song where such a simple and subtle piano accompaniment (from Danny Mitchell) has such an impact on beautifully crafted words. By contrast I Don’t Care Anymore has him turning his back on the fame and fortune that comes with having a name and an image to live up to. Does the lyric, ‘It’s a hard knock situation when the accolades bestowed on your every last creation cries out middle of the road’, betray a bitterness at his lot or an excessive dose of self-reflection? Whatever the interpretation, it is another brilliant piece of song writing. There are two outstanding collaborations on the album. John Paul White and ex-wife Rosanne Cash join Rodney to great effect on the wonderful It Ain’t Over Yet, where any thoughts that life is all in the past are argued away by the vocal intervention of his musical allies. I’m Tied To Ya’ is a love song where Sheryl Crow adds her vocal talents in a tender, heartfelt ballad. 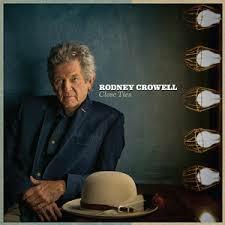 Rodney Crowell first started playing as a teen in Houston garage bands over fifty years ago. Whilst there is a respect deservedly afforded to any artist with such a legacy in the music business it is by no means a given that their musical output will retain a quality and relevance today. Maybe the secret lives in that poetic sensibility to which Crowell refers. Rodney’s ability to write songs that leave an indelible impression on the listener, on the evidence of this beauty, remains gloriously intact.